The Opinionated Pussycat: It's Friday's Wonderful Life! Good morning felinity assembled, Friday the Bearded Lady here and today I am celebrating my 1st birthday! I was born on the streets and my earliest memory is of being alone in some bushes, barely 3 wks. old, and looking up at a human who heard me crying out. Until this week none of us knew why I was there or how I got there...then a lizard showed up on our doorstep with a story to tell and a message for me. The story and photos are shared over 3 blog posts and I invite you to check it out...bring tissues! I have grown a lot since my first profile photo, in Sept. 2015. I have learned so much from my 2 mentors Sneakers the Texian Tuxedo and Elvira Mistress of Felinity and I love them dearly. Daddy Kiril has cared for me from the day we met and I love him, too! Sneakers has been treating this day all serious...and the unexpected visit of the lizard, Guy Ko, only re-enforced that feeling, but, despite this I had other ideas and Elvira and daddy encouraged me in my creativity. This was my idea. Daddy caught Elvira & Sneakers on camera, over by his books, and I decided to have a little fun with the captions. We have no catnip on hand, except in a couple of toys, but I didn't get 'nipped up last night, honest, hee, hee! 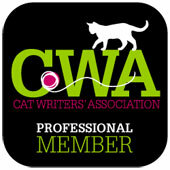 Anyway, settle in for a bit, bring your own 'Nip Tea, treats and kibble, as I celebrate MY way! Good morning felinity assembled, Friday the Bearded Lady here and I was just as surprised as you probably were at what happened in the first 2 parts of this series. There I am getting my beauty sleep and the next thing I know Daddy Kiril is waking me up and telling me a lizard wanted to have a chat with me. Yeah, right, such a kidder that daddy of mine. Except that he was very serious and there really WAS a lizard who wanted to chat with me. Elvira & Sneakers tell me I am now "officially" an adult, even though I still have 5 months until I am a year old. It has all to do with my operation this past week and how I behaved during and after. Okay, if they say so, hee, hee! Anyway, I want to thank Emancipet for putting up with me and for doing the deed in a skillful way. Daddy Kiril got up at 4am, Tuesday, got me in the carrier, and we headed out to catch the bus. We arrived outside the Third Ward Assistance Center, at 3611 Ennis, 40 min. early only to find a few dogs and their humans had got there ahead of us....and one fellow feline and its human. Yup, I had to settle for 2nd cat in line, hee, hee! Cats and small dogs were taken in the small van to the clinic. I DO remember an orange tabby named Simba who was in a cage below mine. We fought off boredom by playing whack-a-paw. The nice lady from the van told daddy that I was a good girl and that was good enough for him. The result was, well, look at the photo and see for yourself, hee, hee! So, after Miss Stephanie cleaned up my carrier and gave daddy the paperwork and a cone, we headed home. 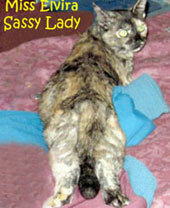 Young Friday the Bearded Lady has been feeling antsy, lately, as she has gone into heat a couple of times. 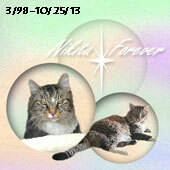 Elvira and Sneakers have helped her understand and get through what she's been feeling. I am going to finally get the girls their nails trimmed, for the first time in months, on my Monday day off. Houston BARC has a free spay/ neuter wellness program for residents on a first come/first serve (but if we can't get you in we can reschedule). There is an event on my Tuesday day off, at a location I can get to by bus easy. Healthy Pets Healthy Streets is a program connected to BARC and Emancipet , Fixin' Houston, SNAP and Friends For Life, that is doing its best to help reduce the number of unfixed animals in the city of Houston. I hope I can get in as I would be able to get her fixed, her rabies vaccine , 1 yr. lic and also a free microchip. Meanwhile she has been using the legs of my table to work on her pole dancing routine and been loudly expressing herself and trying to get extra playful with Elvira and Sneakers. I need to get a cheap litter box and litter and a collar as I will have to put the Cone of Shame on her and keep her from the other cats in my walk-in closet for a few days. Good afternoon, felinity assembled! 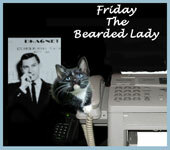 Friday the Bearded Lady here...and boy do I have some explaining to do. While Daddy Kiril was in the shower, this morning, I was bored...not to mentioned impatient for breakfast as usual. So what's a young lady kitten to do? I'd already explored the INSIDE of the pantry a month ago! There was nothing for it but to look around the top of it, next. I made a little too much noise reaching my goal so it wasn't long before daddy was standing there, cell camera in hand, to capture my adventure, or um, misadventure. I was swatting some keys dangling from a doorknob in the kitchen when no-one was looking...when the door opened. This is an apartment in Houston, Texas. However, it didn't take him long to notice what I was doing. Miss Elvira said it is New Year's Eve so some animal bloggers may be watching fireworks or hiding from them. When I asked what fireworks were, Miss Sneakers, my mentor, told me to wait until midnight and my question will be answered. 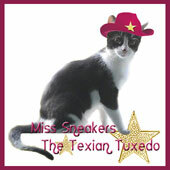 My apologies...my name is Friday the Bearded Lady and I am a Tuxedo like Miss Sneakers. I have been taking lessons on so much stuff since I came into my new home, from Miss Sneakers and some of those lessons have been reading, writing, and using the computer. 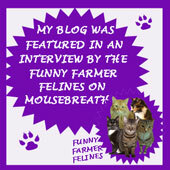 Sneakers and Elvira, surprised me on Christmas Day by telling me they felt I was ready to do my 1st blog post. Would it be bad of me to admit I was freaked out by this news? I was told I was smart and a quick learner, a natural and would do fine.